Oxytech’s new Panel Prep range features all the chemicals any workshop or serious home workshop needs when undertaking metal and fabrication work. The line-up includes sealants, surface preparation solutions and cutting agents. Oxytech surface and substrate solutions are consistent and reliable, meaning you can trust they’ll always work. All Panel Prep products are locally developed using leading chemical specialists and a proven blend of high-quality chemicals. Oxytech’s ANTI-OX is a versatile phosphoric acid based deruster, degreaser and phosphator all in one. 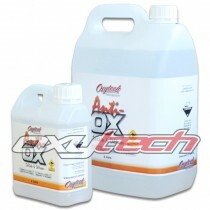 ANTI-OX is designed to attack rust while removing oils and contaminants from the metal surface. 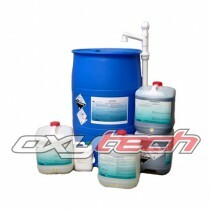 ANTI-OX is also suitable as a bath solution for soaking rusted parts and bolts. ..
Easy Carve is a water soluble cutting lubricant for use in metal working applications such as metal saws and milling equipment, providing excellent lubrication and cooling during operation. 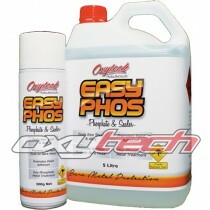 Easy Carve is the product you need if you’re a fabrication shop or have brackets, plates and thick sheet to c..
Oxytech’s EASY PHOS is a one step phosphate, degreaser and sealer for bare metal protection. EASY PHOS is specifically formulated as a pre-paint treatment for steel, galvanised steel and aluminium and is easily applied by aerosol, spray gun or brush. EASY PHOS, when dry, protects the surface from s..
Easy Phos waterless phosphate spray comes as a disposable aerosol product and 5L & 20L liquid bulk pack. It can be brushed, sprayed or dipped and is a perfect way to seal bare steel once you’ve finished working on it, but if it’s not quite ready for epoxy primer. Waterless Phosphate Seals Ra..